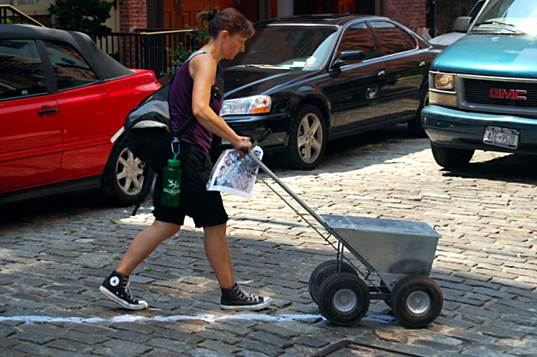 HighWaterLine was the original public artwork on the New York city waterfront that created an immediate visual and local understanding of the affects of climate change. Eve marked the 10-feet above sea level line by drawing a blue chalk line and installing illuminated beacons in parks. The line marks the extent of increased flooding brought on by stronger and more frequent storms as a result of climate change. During the summer of 2007, Eve walked, chalked and marked almost 70 miles of coastline. As she was out in the public creating the work, Eve had a chance to engage in conversations about climate change and its potential impacts. This original performance has evolved in time and place, happening afterwards in Philadelphia and Miami and soon in 2014 in Bristol and Boston in 2015. Those being collaborations with other organisations and communities. As climate change continues to accelerate, causing extreme weather from devastating droughts to extreme floods, communities are seeking innovative ways to develop community based resiliency to climate change. HighWaterLine brings together community members and experts from diverse disciplines to devise climate change resiliency at the local level. We do this via workshops and public art activities that facilitate knowledge sharing amongst community members while also introducing new skills and facilitating new community collaborations. Images courtesy of the HighWaterLine project.